Usually Stone Brewing Company never lets me down. But maybe I'm getting bitter and old or maybe I'm becoming a beer snob because this time they have. Sorry, Stone Brewing. 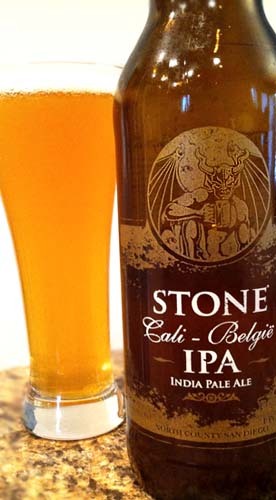 Stone Brewing's Cali-Belgie IPA pours a mildly hazy, dark straw color with a thin, quickly dissipating head. It smells of sweet, sweet hops with touches of florals. Tasting brings milder flavors than I'm used to from Stone Brewing with sweet mild hops, a dank sweet maltiness, some tropical fruits, and hints of banana esters. The finish is short and unremarkable. Honestly this is FAR too tame for a Stone Brewing beer. Yes, it has characteristics of both a Californian IPA and a Belgian beer, but both aspects are just weak. Were both the Belgian and California IPA aspects kicked up a few notches this would be one helluva beer. As it stands it's not bad, not great. Sorry, Stone Brewing, this one was a let down. Drink This: if you want to try a California IPA/Belgian hybrid beer. Don't Drink This: if you're looking for the typical in-your-face Stone Brewing style beer.